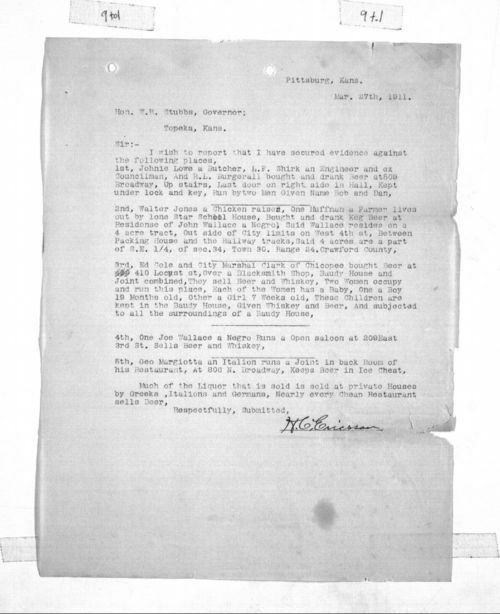 H. C. Ericsson, special investigator into illegal liquor sales, reports his findings directly to Governor Walter Stubbs of Topeka (Shawnee County). This report regards Ericsson's visit to Pittsburg (Crawford County). The report lists five "places" at which he was able to purchase liquor or beer. Racial identity is an important aspect of the reports as the investigator identifies the race of those participants considered non-white, including Negroes, Greeks, Italians, and Germans. The report also discusses roles played by women and children in the liquor trade. Kansas first adopted a constitutional amendment on prohibition in 1881 and by 1909 had outlawed the sale of liquor for medicinal purposes. At this time, Governor Stubbs was particularly frustrated by the federal government's refusal to prosecute Kansas bootleggers from whom it was collecting taxes on liquor sales. People - Notable Kansans - Ericsson, H. C.